Mary Jo Hanover Award recognizes exceptional dedication and outstanding contribution to the field of economic development. 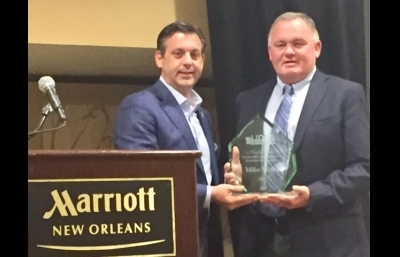 On Nov. 8, Mike Sibley, Cleco manager of economic development southern region, accepted Louisiana Industrial Development Executives Association’s (LIDEA) Mary Jo Hanover Outstanding Achievement Award. Founded in 1964, LIDEA is an organization committed to the development of individuals involved in economic development efforts in Louisiana through education, public policy advocacy and collaboration. The presentation of the award is at the discretion of the board and it is only awarded in years when an appropriate nomination has been submitted and approved by the LIDEA Board of Directors. In 2001, Sibley joined Cleco’s economic development team, where he uses his vast experience to make significant economic contributions to better the community and Cleco. Sibley volunteered in the aftermath of Hurricane Katrina and worked closely with St. Tammany Economic Development Foundation’s community initiatives. During his time at Cleco, Sibley has been instrumental in the retention and expansion of Procter and Gamble, as well as bringing Plastipak, a plastic packaging manufacturer and distributor, to central Louisiana. Before coming to Cleco, Sibley worked on the Red River Waterway Navigation Project, which changed the nonnavigable Red River into a channel for transporting commodities and resources. He also served as executive director of the Port of Natchitoches and obtained funding for the Louisiana Highway 486 realignment project, among numerous other projects. A summary of Sibley’s other economic accomplishments include $294 million in capital expenditures, resulting in 1,580 direct jobs.